Bethesda has come up with a serious prize for fans that want to name their children after Skyrim's main character. What once seemed like a joke is now a very real contest where Bethesda wants fans to name their newborn babies after the main character from Elder Scrolls: Skyrim. At first, Bethesda was keeping the reward a secret, but now it's specified one very incredible prize. 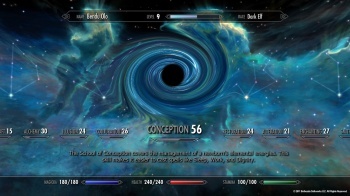 An update to the Bethesda blog reveals that if anyone is crazy/serious enough to name a child "Dovahkiin," which means "Dragonborn" in Skyrim's dragon alphabet, and that child is born on November 11, 2011 (Skyrim's release date), the family will receive a Steam key that unlocks every ZeniMax/Bethesda game ever. That means past, present, and future. Now that's a reward. I don't even think young Dovahkiin would argue with the merits of taking on the name when you gain access to such a huge library of games. The ZeniMax banner includes Bethesda, but also other studios such as id Software and Arkane Studios. That means a winner would get every title in id's lineup like Doom 3 and Rage, in addition to future Elder Scrolls and Fallout titles. The blog also says that there's even more surprise "loot" to be awarded if the task is pulled off. God, I want someone to do this so badly, but lightning really has to strike for Elder Scrolls obsessed parents to have a child on such a specific date.